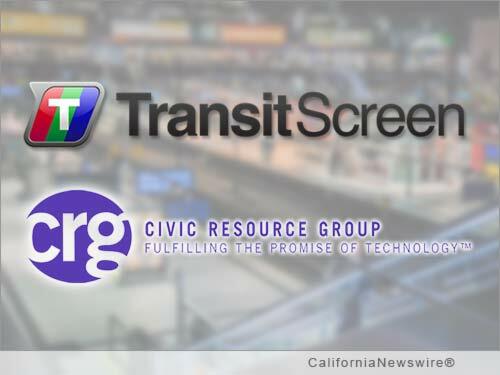 SAN FRANCISCO, Calif. /California Newswire/ — Civic Resource Group (CRG) and TransitScreen, Inc. today announced they have joined forces to modernize the transit displays in 46+ different locations across the San Francisco Bay Area as part of the Metropolitan Transportation Commission (MTC)'s Hub Signage program. CRG is a prime contractor to MTC for elements of its 511 Next Generation (Next Gen) System. The company will design and operate the new 511.org website, manage transit data, and migrate the existing Regional Transit Database to the cloud. CRG has subcontracted with TransitScreen, a pioneer in multimodal transportation displays, to modernize signage for the Electronic Traveler Information Displays portion of the project. TransitScreen provides rich, easy to use, and relevant transit information to millions of weekly users in locations throughout the US. The goal of the joint effort is to provide 511's comprehensive, real-time and scheduled transit departure information on current and future electronic transit information displays. The redesigned MTC displays will help drive increased transit use, sustainable transportation awareness, and overall usability by the traveling public. Once complete, the system will deliver transit information to 180 transit displays in 46+ high foot traffic locations throughout the nine county Bay Area including San Francisco, San Jose, Oakland, Berkeley, Mountain View and other Bay Area cities. "This project is an opportunity to meaningfully improve the transit customer's experience. Bay Area travelers have come to trust 511's departure times delivered through MTC's network of digital transit information displays. Now, we have the opportunity to use TransitScreen's proven solutions to jointly create world class information signs," said TransitScreen CEO Matt Caywood. MTC initiated its Hub Signage program in 2008 to standardize the signage system, beginning with 21 key transit hubs and three international airports in the Bay Area. The program seeks to simplify transit riders' experience by creating a consistent "look and feel" through actionable, real-time information. "Urban mobility is becoming a key focus area for local governments. Transportation agencies now rely heavily on technical innovation to improve mobility while also reducing accidents, carbon footprint, traffic jams, crowding. We feel that it's our civic duty to help agencies be more creative not only in encouraging citizens to use alternative forms of transportation, but most importantly making it easy for today's mobile citizens to get around whenever and however they choose," said Dr. Gregory G. Curtin, Founder and CEO, Civic Resource Group. Civic Resource Group (CRG) is a leading digital government product company. The company pioneered CivicConnect(TM), its first-of-a-kind Mobile/Cloud/Data platform. CRG most recently rolled out its Augmented Reality-based product for the public sector, CivicAR(TM). Since 2000, CRG has been "Fulfilling the Promise of Technology(TM)" for the broad public sector, helping public agencies harness digital advances to connect with their constituents and deliver better and more efficient services. CRG is headquartered in Los Angeles, Calif., and Dublin, Ireland. In 2015 CRG was named to the list of Top 20 Government Technology Providers, along with being spotlighted as "Public Sector Augmented Reality Leader" by Wall Street Forensics. CRG is a new breed of company with a new signature approach, blending the best of technology, design and communications in the digital age to support Sustainable Communities, Efficient Public Services, Engaged Citizens and Better Quality of Life. TransitScreen is a Washington, D.C.-based software company providing real-time transit information for the connected and walkable cities of the future. The TransitScreen service is a live, real-time display of all transportation choices at a specific location (including subway, bus, train, bikeshare, and carshare). Founded in 2012, TransitScreen makes transit information more accessible, viewable and engaging so that commuters, visitors, residents and employees can make informed transit decisions. Today, millions of people across North America and Europe live and work in institutions, organizations, companies and shops displaying TransitScreen's multimodal transportation information. 511 is a one-stop phone and web source for up-to-the-minute Bay Area traffic, transit, rideshare, bicycling, and parking information. It's free of charge and available 24 hours a day, seven days a week from anywhere in the nine-county Bay Area. 511 is managed by a partnership of public agencies led by the Metropolitan Transportation Commission, the California Highway Patrol, public transit agencies and the California Department of Transportation (Caltrans). MTC's Hub Signage Program is improving transit signage and schedule information for bus, rail, and ferry travelers. MTC has installed new maps, better signage, and electronic displays with real-time transit information in and around Bay Area transit stations to make navigating easier for transit customers and to complement already available transportation information. For photos of Hub Signage Program installations, please visit: http://www.mtc.ca.gov/news/photos/hub_signage.htm. MTC is the nine-county San Francisco Bay Area's transportation planning, coordinating and financing agency. Visit CRG at http://www.civicresource.com/ or contact us info@civicresource.com. Visit TransitScreen at http://transitscreen.com/ or contact us press@transitscreen.com.